Not long ago, action cameras were the hottest gear. Small enough to fit into any pocket and easy to use, these little point-of-vew camcorders also could capture high-definition video. The ability to mount the camcorders on a variety of surfaces or accessories only bolstered their original appeal, along with their rugged build components. 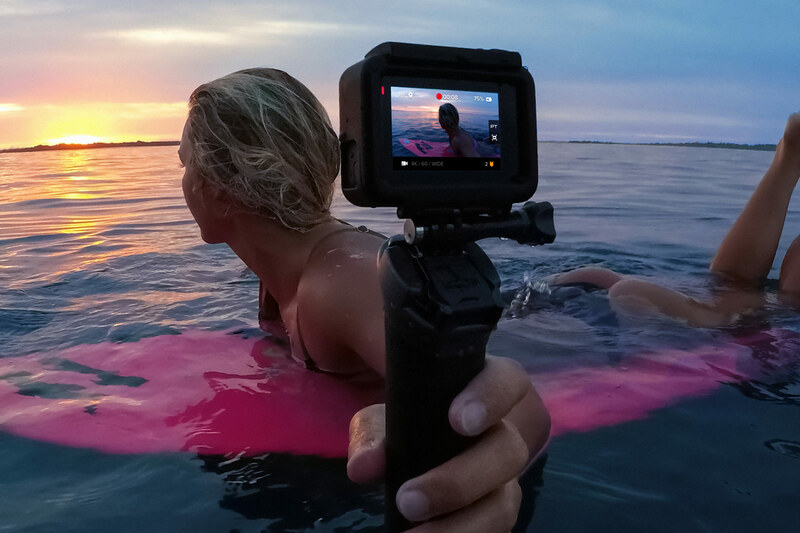 Led by GoPro — the company that essentially created the action cam industry — its Hero cameras were in-demand by everyone, from teens to professional filmmakers. Now, fast-forward to the present. While GoPro is still the undisputed champ, there are a lot more players — from no-name budget manufacturers that want a slice of the pie, to major camera makers like Sony and Garmin, which sell cameras that rival GoPro in terms of image quality and features. GoPro still makes one of the better action cams, although it’s now joined by a few capable friends. Each is fun to use and adept at shooting quality movies you can share on YouTube, whether you want to capture wide-angle shots of your local half-pipe, the big waves down the road, or aerial footage from your drone or dog’s point of view. Below are a few of our current favorites. Why should you buy this: It is the one action cam to rule them all. It’s the most useful action cam for novices and professionals. If you are looking for a versatile action cam that’s simple to operate yet offers advanced features when you need it, the Hero6 Black is our favorite. GoPro’s latest flagship comes in $ 100 above the identical-looking Hero5 Black, but it isn’t just a rehash of the old. It is the first GoPro to use a custom-designed image processor, called the GP1, and that turns the Hero6 into a very capable machine. It starts with 4K video at 60 frames per second (fps), up from 30 in the Hero5. Full HD has also seen improvements, with a 240 fps mode for super slow motion, again doubling what the Hero5 could do. In addition, image quality has also been improved, particularly the dynamic range, which helps prevent detail from being lost in dark shadows or bright highlights on sunny days. The GP1 chip also makes for improved stabilization, which GoPro claims is similar to mounting the camera on a gimbal. As for our own experience with it, we say it looks dang good. But for everything that the Hero6 does well, our favorite aspect of any GoPro remains the ease of use. The touchscreen is intuitive and responsive, the voice commands work well, and being fully waterproof without the need for an additional case keeps it compact and simple. QuikStories are also better than ever thanks to the improved computer vision of the GP1 processor, helping you to create painless highlight reals on your mobile device in a flash. It’s not easy to make such a small camera fun to use, but GoPro has done it — again. The only action cam to include built-in optical image stabilization. When it comes to image quality, we find Sony’s Action Cam products to be up there with GoPro. Models like the new X3000 are easy to use and shoot 4K video. It doesn’t offer the fine-tuning features that the Hero6 Black does, but the X3000 one-ups it (and all other action cams) with built-in optical image stabilization. Other action cameras that advertise built-in stabilization all use electronic IS — even Sony’s other cameras have had it for some time — but the Balanced Optical SteadyShot (BOSS) in the X3000 is true stabilization. In optical stabilization, the lens and/or sensor physically moves to counteract motion. Compared to digital stabilization, which basically crops and then “pans and scans,” this doesn’t result in a loss of resolution. Optical stabilization therefore leads to better image quality than cameras that use electronic IS. The X3000 is on the pricier side, but if you don’t need 4K, Sony offers the Full HD 1080p HDR-AS300 for $ 300, which includes BOSS. Why should you buy this: This camera tracks your activities with real data. This is for those who want pure data along with visuals. Any action camera can capture what happens in front of the lens, so Garmin went a step further and built a camera that also collects additional data like speed, position, g-force, hill grade, and more. When working in tandem with Garmin body sensors, it can also measure temperature and heart rate. So, not only can you watch a video of how fast you’re riding a bike, but also see the actual MPH and incline – displayed on top of the video. Called G-Metrix, the Virb Ultra 30 includes five sensors that measure various aspect of your activity. If you regularly monitor your progress, it can show if you are improving (or not). This kind of data can also be evidence you can use when bragging about how high you bike jumped. And a bonus: It can live-stream to YouTube for all the world to see. Why should you buy this: It is a sporty camera with optical zoom and larger sensor. This compact point-and-shoot moonlights as an action cam. 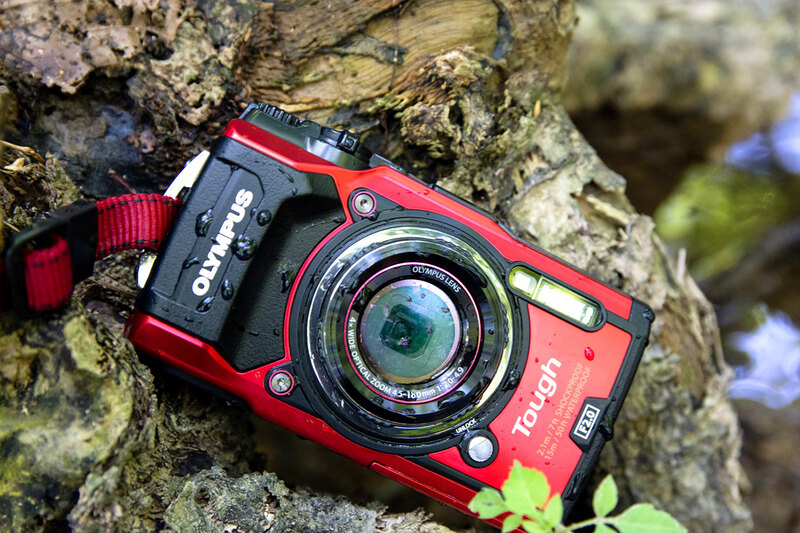 Yes, we admit this is a stretch: The Olympus Tough TG-5 is technically a rugged point-and-shoot camera, and while it is compact enough for a pocket cam, it’s bigger than your typical action cam. That said, the TG-5 has some notable action cam attributes. Its body is built to withstand the elements without a protective housing. That means you can drop it, take it into the water, get sand on it, or freeze it without worry. It’ll take the abuse, which is why it’s a good action cam for adventurers, and those who want some standard camera capabilities that go beyond capturing POV footage. It also has a larger sensor and a wide-angle lens with true, 4x optical zoom with sensor-shift image stabilization. For action sequences, it can shoot bursts up to 20 fps. Finally, the TG-5 lens also has a microscope mode for capturing things incredibly up-close. It shoots RAW photos and 4K video, uses GPS to record your location data; and leverages Wi-Fi to let you share to online. An optional accessory, called the Sport Holder, also allows you to attach the camera to your belt or backpack strap, making it handy when used as an action camcorder. It may be large, but it’s more versatile. A tiny camera that embodies the best of GoPro, with a lower price. You can find plenty of action cams for around $ 100. Despite being labeled “cheap,” the Hero Session is on the higher end. However, compared to even cheaper offerings, we think the Hero Session offers a lot of value for the money. Even though it’s small, it’s durable and well built, waterproof without a case. Its one-button-push recording makes it simple to use, and it’s capable of shooting really nice looking videos and photos. The size also makes it a good choice for those who want to mount an action in unconventional places, allowing users to capture footage with creative POV. You should know that GoPro no longer carries the Hero Session officially, but it can still be easily found at many retail shops. GoPro has a new entry-level Hero camera for $ 200, and has many features found in the flagship Hero6 Black listed above. Still, we like the uniqueness of the Hero Session so much that we’re keeping it on our list. To find the best models, in addition to image quality, we factor in criteria such as usability, speed, low-light strength, video performance, durability, form-factor/compactness, and any unique features that help them one-up the competition. Our selections are based on our long- and short-term testing; experience with earlier models; familiarity with the companies’ technologies; consultation with industry experts, fellow journalists, and users; online forums; lab results (such as DxO); and other third-party reviews. We look across the board – not just our own experiences – to find consensus on what we think are the best-performing cameras you can currently buy. We also look at list pricing to determine if a product is worth the cost, its availability, and is future proof enough to recommend. We may even recommend cameras that aren’t new, provided the features are still best-in-class. The camera market evolves constantly, with manufacturers often introducing better models with new features. So, you can expect our picks to change, as well. But don’t worry: The models you see here will be with you for some time. If we anticipate that better models are on the horizon, we will state that upfront to help you decide whether you should buy now or wait. An action camera is a compact camcorder designed to capture the perspective from its user’s point of view. They are generally simple to use, rugged, and can shoot both video and stills. The latest batch of action cams are incorporating more advanced features that differentiate themselves from one another and against budget offerings. This type of camera was made popular by GoPro, and has become synonymous with extreme sports (hence the name). However, action cams can be use for any occasion (GoPros are even used in filmmaking and broadcasting). Their small size and light weight allow them to be used in many creative situations, and they can be mounted in places where traditional cameras and smartphones can’t, like the bottom of a skateboard, on a pet, or even space. Because they are small, action cams rely on smaller sensors than typical point-and-shoot cameras, yet companies like GoPro and Sony have managed to pump great image quality out of their latest models, including 4K video. For optimal performance, they require a lot of light, but when conditions are right, they can shoot terrific photos too. Many also include Wi-Fi, allowing you to pair with a phone or tablet for remote live view and online sharing.